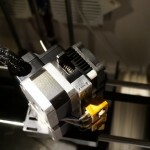 PLA should be cooled as quickly as possible after leaving the nozzle in order to obtain the best results, especially in challenging situations, such as steep overhangs. The large fans mounted at the backside of the printer provide a steady air flow across the entire build platform. 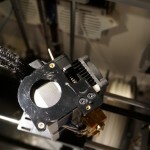 However, when printing PLA, the air flow should be more concentrated around the nozzle in order to be effective. 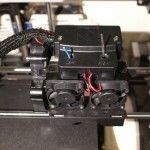 Flashforge fitted later models with the aptly named “Turbo Fan”, directed primarily at the left nozzle. I decided to try this option first before attempting to design my own fan/duct system. 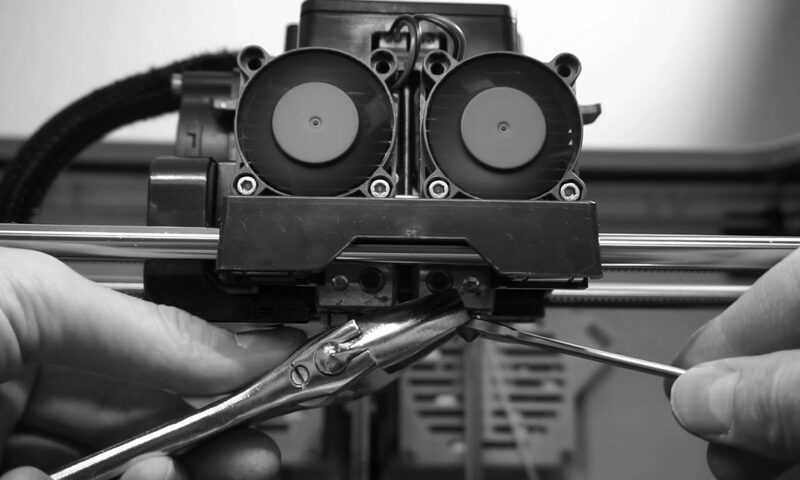 In the Netherlands it is not possible to order directly from Flashforge. When ordering from the US website, costs for shipping and customs are close to 100 euro. On Aliexpress the original (?) Flashforge parts can be obtained for a very reasonable price and shipping is free when opting for China Post Registered Air Mail. The turbo fan costs €17,40 at the time of writing and the fan duct can be purchased for €11,65. Check the links below for details and current pricing. The delivery times with the China Air shipping method can range from anywhere between 2 weeks and 2 months. In this case I received my parts within 3 weeks. 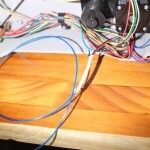 Using google I found a picture showing the positions of the mounting holes on the aluminum extruder strip. I marked the estimated positions of the holes on my own extruder strip. The bolts have an M3 thread. The holes were pre-drilled using a 2,5mm drill bit. 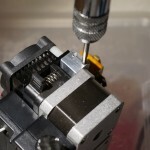 The depth of the drilled holes should be around 5mm deeper than the depth the actual bolt reaches, in order to compensate for the fact the the first couple of threads will have an incomplete diameter. This is due to the shape of the tap which is tapered at the tip. 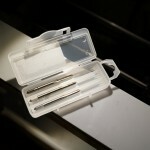 A three stage tap set was used to thread the holes. 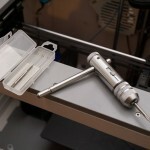 Each tap (taper tap, second tap and finally the bottoming tap) will form the shape of the thread to create the final M3 thread. Since the M3 threads are small and the aluminum is a relatively soft material, care has to be taken not to damage the threads by excerting too much force. After tapping the holes, the mounting bracket can be attached, followed by the turbo fan and fan duct. In order to complete the installation, the supplied cable has to be routed through the cable guide and plugged into the driver board. 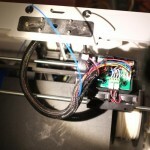 After some trial and error I found that a simple way to pull the cable through the cable guide was to use some filament. First remove the brackets holding the cable guide. 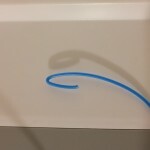 Bend the end of the filament to prevent it from getting stuck and push it all the way through to the bottom of the printer. 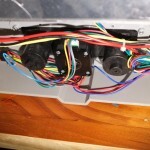 A piece of tape can then be used to pull the fan cable through. 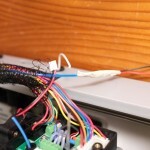 The cable should be attached to the “Fan” connector on the driver board. 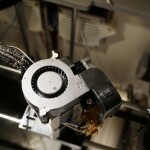 This allows control of the fan through the flashprint software. 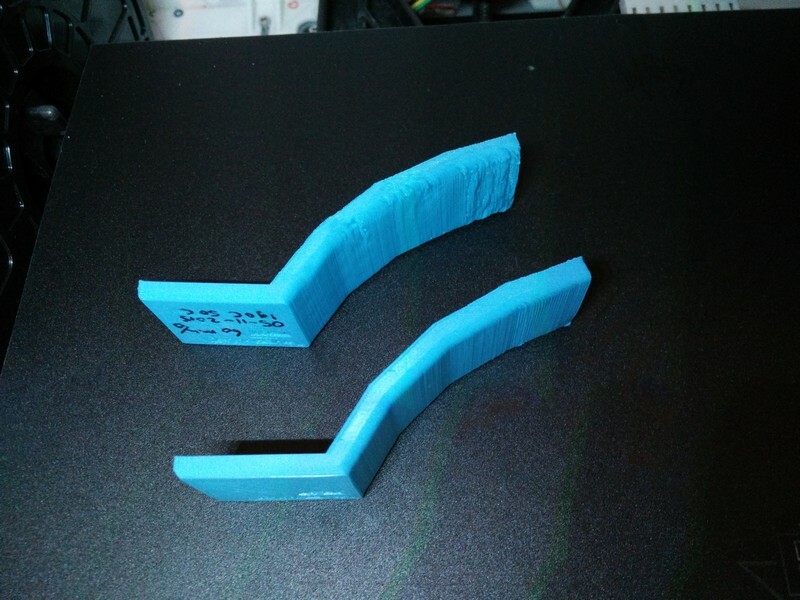 The picture below shows two Makezine test parts for evaluating overhang performance. 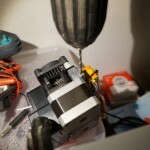 The used material is Formfutura Easyfil PLA. 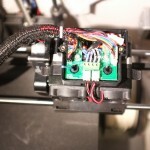 Print settings: extrusion temperature 190C, bed temperature 50C and speed 60 mm/sec. The top part was printed using only the back fans. The bottom part was printed with both the back fans and the nozzle turbo fan on. A dramatic improvement was obtained with these settings. The print quality is better across the entire part, but is most visible in the last section, which has an overhang of 70 degrees. 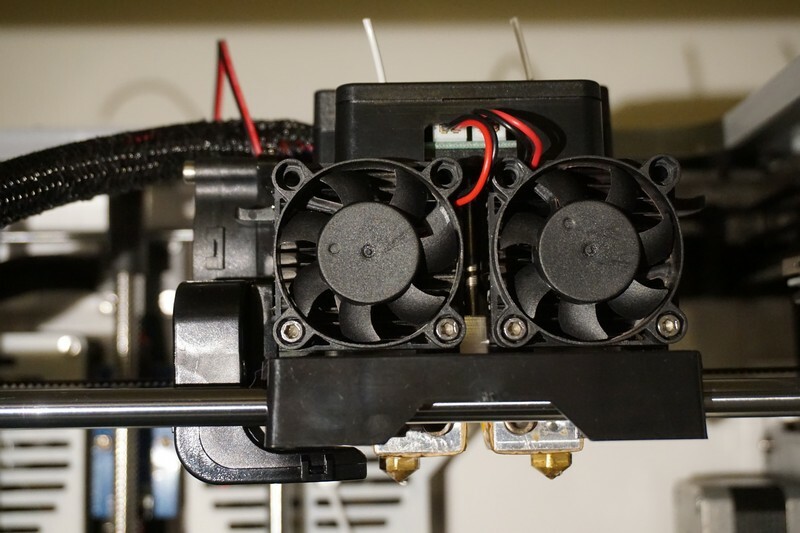 The stock Turbo Nozzle fan enables the Flashforge Dreamer to deliver very good results when printing with PLA. The upgrade is definitely worth the effort. Disclaimer: If you consider performing the upgrade yourself, it may void your warranty. Also, it is completely at your own risk; I am not liable for any damage or injury caused by you performing the upgrade. Thanks for posting your guide! 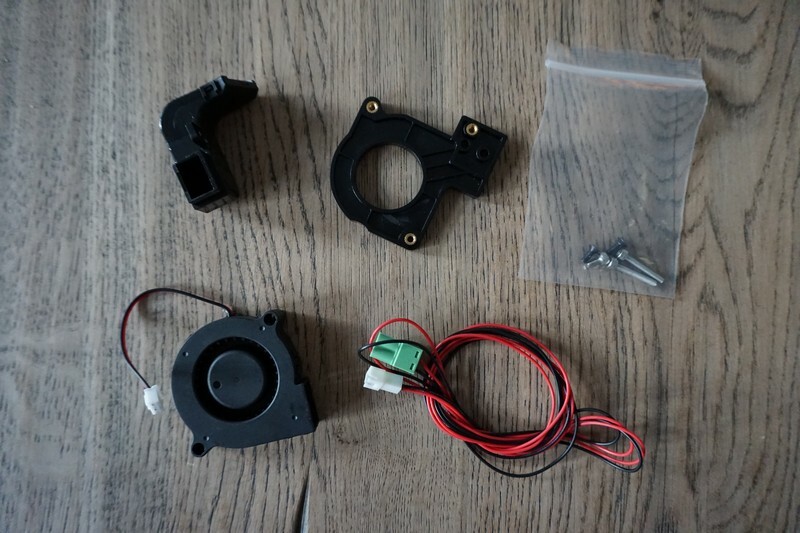 I have a Monoprice 3DP (basically a FFCP clone) and bought one of these fans. I couldn’t quite figure out how it all should have come together before reading your post and seeing your photos. I have got a FF Creator Pro 2016 and it came with this fan pre-installed, however I haven’t figured out how to get the thing to power up. Any ideas? 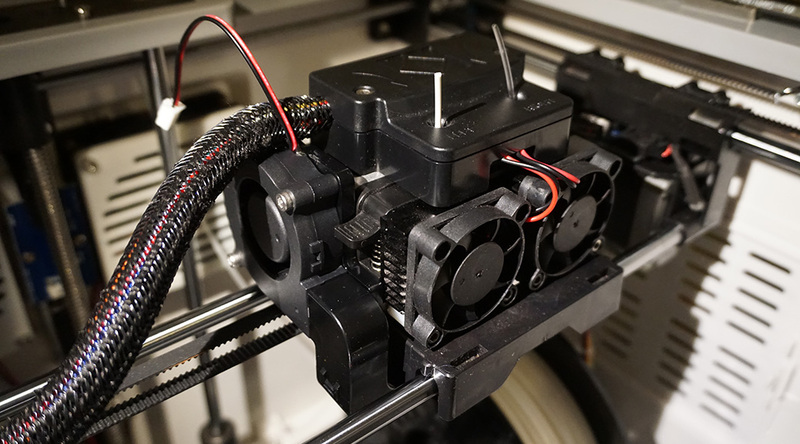 If you are using Flashprint for slicing your models, it should be as easy as selecting a PLA based profile and selecting ON in the print menu under cooling fan controls. (or after a certain height, which I prefer). But you have probably already tried this. If you are using Slic3r, you could try the M106 command for Fan on in the top section of the file and M107 command for fan off at the end of the file. This is assuming the Pro uses the same M-codes for fan control as the Dreamer, which I am not sure of. 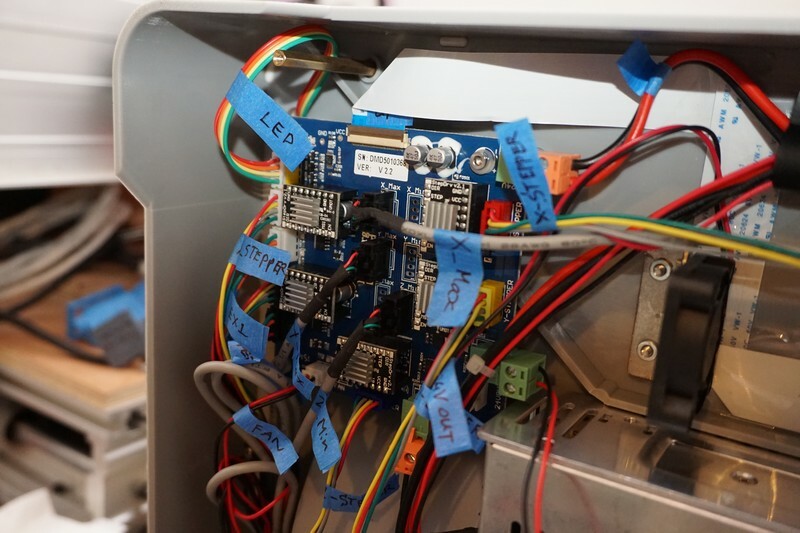 IF you are still having problems, check the connector of the fan on the driver board and measure if the connector is outputting 24V when the program is running. Thanks for the reply! Can’t get flash print working, but will be sure to try again.. thanks for help!